Beach - Right ON an all tide swimming beach. Private access from the extensive lawns with no road or dunes to cross. Superb outdoor living with a large furnished entertainers deck and BBQ. Dinghy and 5 Kayaks or swim to the diving pontoon in front. Rinse off under a hot outdoor shower. Views - Unobstructed beach and sea views with an endless procession of passing boats and romantic sunsets. Bedrooms - 4. 1) King master with heated ensuite bathroom, TV and sea views. 2) Qu & Sgl with sea views 3) Qu & King Sgl 4) Massive rear family bedroom King, King Sgl, 3 x Sgle. Sofas, AC, fridge, TV, DVD and BT sound system. Base rate includes up to 6 guests. Extras $NZ35 pp per night based on booked stay duration. Linen, towels, consumables and post stay cleaning provided. Children under 2 free of charge if not using a bed. No functions or parties. Shorter stays between bookings - please ask. A bond may be requested for groups and wedding related stays. Bedrooms allocated 2 people per room up to 6 booked guests. All 4 bedrooms are available when booked for 7 or more guests. This is our peice of paradise. Since 2001 Tapeka del Mar has been enjoyed by local and international guests. The beach house has been set up with international visitors in mind. We believe the location, beach, facilities and local attractions are unequalled. Private - guests enjoy exclusive use of the beach house, grounds and all facilities. There are no on site owners or managers. Beachfront - few properties are actually on the beach without a road in front or sand dunes to negotiate. Views - unobstructed panoramic views. Being next to the main shopping channel there are always vessels passing by. Capacity - the extended family can all stay together or share with friends as the 4 bedrooms can comfortably sleep up to 13 guests Watercraft - 5 kayaks and a dinghy (row boat) are included with life jackets provided Location - being so close to Russell this is the perfect base to explore the Bay of Islands and the entire Northland region Fully Equipped - Tapeka del Mar is furnished and equipped to a high standard. All towels, beach towels and linen provided ready to walk in and enjoy. Free Wifi, satellite TV channels, home theatre system, its all here. Cooking - if you must the granite kitchen has an oven, gas hobs, ice maker, blender and ample serving dishes etc. Outdoor BBQ also supplied. Boating - if bringing a boat the is a guest mooring, boat ramp, trailer parking, boat freezer and filleting station for the days catch. Tapeka is the closest launching points to the many Islands and fishing spots in the bay. Quality bed linens and towels provided. Comfy sofas with a nautical theme and glass sliding doors that open the room onto the deck. Stunning views await. Extensive grounds for exclusive guest use. The beachfront location close to attractions on an all tide swimming beach is very rare. Awesome house, awesome setup, awesome for children! Unique and great spot. Lovely property. Spacious, clean and well organised team looking after us. Thanks Clive and Cherie! Boat trips around the islands, swim with Dolphins cruise, bush walks through Kiwi habitat, historic places, parasailing, nearby world top 100 gold course. 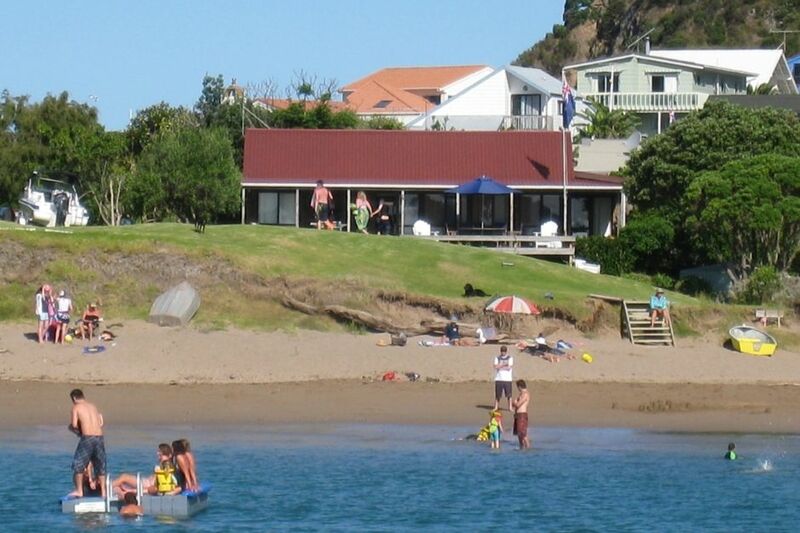 This is the gateway the the famous Bay of Islands and the ideal base to explore Northland. Just 2 minutes from shops, restaurants and attractions. Tapeka del Mar is a destination in itself with so many included facilities and activities close to the house. read our guest reviews. You will not be disappointed.